"Restaurant is lean on menu, long on taste." By Pete Bishop. Clipping in two parts 3.25" x 6" adhered to cardboard with cellophane tape. Gilbert's restaurant (later occupied by the Bloomfield Bridge Tavern) was co-owned by Charles Tierney. 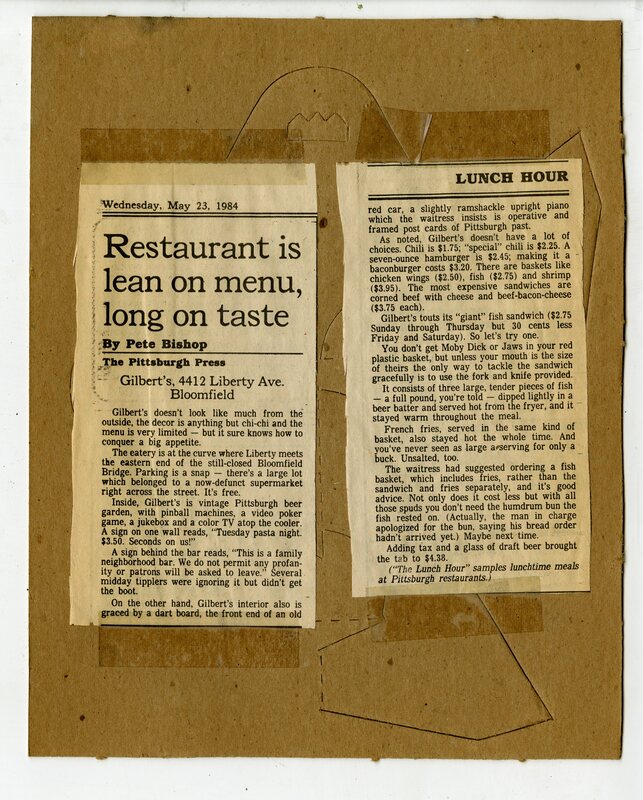 This clipping was found taped to the back of a frame holding the Pittsburgh Tavern Guild Calendar also featured in the the Charles Tierney Collection. These materials may be shared and adapted for non-commercial purposes, but the materials must be attributed to the Pittsburgh Queer History Project. Please see the Creative Commons license website for details. 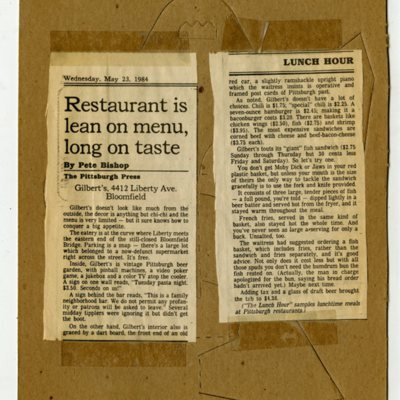 “Clipping restaurant review of Gilbert's 4412 Liberty Ave. Bloomfield,” PQHP Online Archives, accessed April 22, 2019, http://pittsburghqueerhistory.com/omeka/items/show/1761. If you see an error in this information, please notify us.